Hawaii's Finest presents their annual May Day event. A whole evening featuring culture and music. The event features entertainers Raiatea, Weldon K. , Na Hoa, Liam Punahele, Na Wai Eha, Kapena, and a bunch of special guests. Also enjoy the culture with Hula and numerous local vendors. Preferred Seating tickets and VIP ticket can be purchased on this page. Join us Wednesday May 1st at The Bishop Museum for a full evening of food, drinks, festivities and music. Reserved Seating: Access to the orange, green and blue areas. There will be reserved seats (Open Seating) in the orange area for you. VIP Seating: Access to the yellow, green and blue areas. 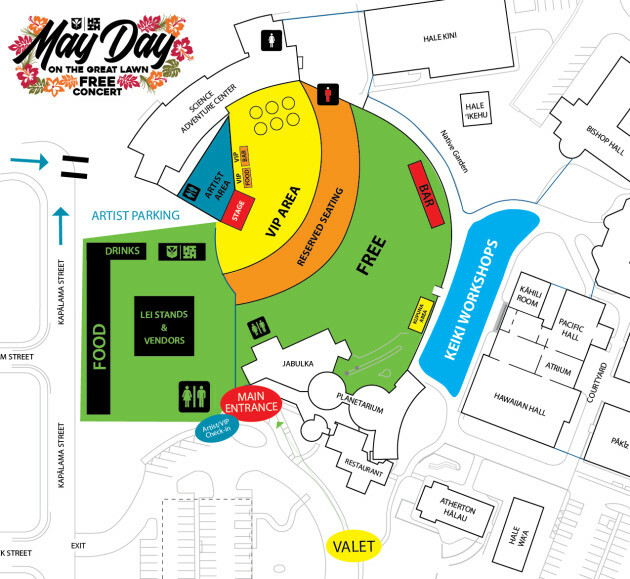 VIP comes with a reserved seat (Open Seating) in the yellow area along with pupu (4pm-7pm), VIP Access, VIP Lanyard, and a private discounted bar. *There will be a Kupuna Section in the Free General Admission Area with seats and tables available on a first come first serve basis. *Tickets Purchased Online is transferable.